(CN) – Breitbart News CEO and former Trump strategist Steve Bannon is not a man who inspires mixed emotions. He is, to Republicans and Democrats, among the most polarizing figures in contemporary politics. To GOP traditionalists, he’s a bomb-thrower intent on nothing less than unseating the status quo. Democrats, meanwhile see him a white supremacist-embracing misogynist, the current Darth Vader of American politics. But aside from broadsides aimed at Senate Majority Leader Mitch McConnell, that wasn’t the man on display as he spoke at the Citadel in Charleston, South Carolina, this past weekend, or in McComb County, Michigan, or Manchester, New Hampshire, last week. No, the Steve Bannon who addressed the Citadel Republican Society and those other GOP audiences was nothing less than the consummate political strategist — and one who repeatedly confessed that his best ideas, those he says propelled Donald Trump into the White House, were largely borrowed from Democrats. Indeed, watching and listening to Bannon first-hand and in close quarters, one of the very first thoughts I had was, “Oh my God, He’s James Carville 2.0.” And I failed to disabuse myself of that notion even days later. What was clear from his recollections of the 2016 campaign was that he maintained a laser focus on the details and mechanics of the contest throughout, and that he still relishes the opportunity to tweak an opponent mercilessly. He was at turns biting, humorous, and surprisingly humble in a very Southern kind of way. Perhaps their shared Southern ties heightened the connection between Bannon and Carville in my mind, but I think there is more to it than that. Bannon’s repeated jabs at Hillary Clinton, McConnell and the “opposition party,” as he frequently calls the press, were not so different from the sarcasm Carville thrust at President George H.W. Bush and billionaire Independent candidate Ross Perot during the 1992 campaign. The similarities extend to the views they expressed toward the press. To Bannon, reporters from The Washington Post, CNN and The New York Times are little more than extensions of the Democratic National Committee. But his critiques — mostly aimed at the ongoing probe of Russian meddling in the 2016 election — are also reminiscent of Carville circa 1992, when he lashed the press for its reporting on candidate Bill Clinton’s “bimbo eruptions” after Gennifer Flowers came forward to say she’d had a long-term affair with the then-Arkansas governor. There’s yet another parallel between Bannon’s approach to Carville’s handling of the Bill Clinton campaign in 1992: both were forced to wage heroic efforts to keep their candidate on message and tempers in check when gaffs and scandals threatened to derail their presidential hopes. In Charleston, Bannon recalled telling Trump to ignore the outside distractions. “We are just going focus, focus, focus on [Clinton]. She is the tribune for a corrupt and incompetent elite … and you are the agent of change,” he said. Carville took much the same approach in taking on President Bush in the 1992 general election. Bush, the Clinton campaign said, was out-of-touch with the average American and therefore unequipped to address his problems. Bannon himself did not refer to Carville last week. Instead, he gave the foundational credit for his campaign philosophy to other Democrats: his good friend Patrick Caddell and to the 2008 campaign run by David Axelrod for Barack Obama. Caddell, a native South Carolinian who now lives in Charleston, worked on the Democratic presidential campaigns of George McGovern, Jimmy Carter, Gary Hart, Joe Biden and Jerry Brown. According to a 1987 profile in Washington Monthly, Caddell based his campaigns on the premise that winning contemporary elections is all a matter of appealing to alienated voters by attacking the establishment as the cause of their alienation. Bannon and Trump took that page from Caddell’s playbook and ran with it. Bannon also adopted whole Caddell’s theory of the “permanent campaign,” an approach he continued to espouse until he left the White House last summer and which Trump seems only too willing to continue. Trump’s approval ratings are at a near-record low. A Quinnipiac University national poll released Tuesday shows American voters disapprove 58-35 percent on the job he’s doing as president — which is actually an improvement over his lowest approval score, 61-31, in an Aug. 2 poll from the university. But the permanent campaign continues, with Trump regularly leaving Washington to rally his base and a never-ending flow of commentary issuing forth from his Twitter account. Bannon also borrowed heavily from the campaign playbook strategist Axelrod and then-candidate Obama deployed in 2008, first by painting Hillary Clinton as “the consummate Washington insider” at a time when the Obama camp believed the nation was looking for change. As is well-documented, the Axelrod/Obama campaign also perfected the use of using so-called “Web 3.0” technology and viral media to gin-up grassroots support. Obama’s web platform allowed supporters to blog, create their own personal webpages and even run phone banks on behalf of the candidate from their homes. The difference in 2017 was that the supporters Bannon was trying to motivate weren’t the tech-savvy young people who embraced Obama. Instead, he took a kind of back-to-the-future approach. “We … empowered grassroots organization to go door-to-door, because in the digital age, it’s not the commercials that count, it’s someone ringing a door bell, with passion and understanding of who you are as a candidate, and making your case for you,” he said. “At Goldman Sachs they told us not to try to invent something, but to improve what’s already been invented,” Bannon added, referring to one of his former employers. Despite his leaving the White House on Aug. 18, 2017, amid a string West Wing shake-ups, Bannon in Charleston and in his other appearances last week remained steadfastly all-in for Trump. We can all remember the stories immediately after Bannon’s departure, the majority adopting the theme “Uh oh, Trump’s in trouble. He’s made an enemy of Bannon and is going to get withering criticism on his right, populist flank.” Well, that didn’t happen. 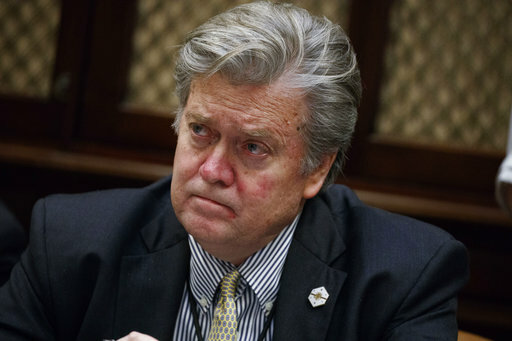 In fact, Bannon himself sought to discredit the storyline as early as September, when he delivered a keynote address in Hong King on the subject of “American economic nationalism, the populist revolt and Asia” at an event organized by the international brokerage firm CLSA. “I left the White House because Trump needed a wingman outside, helping candidates for the Senate,” he said. But that also brings up another point, which is Bannon’s departure from the White House was inevitable. If you look at administrations since Bill Clinton took office, the big guns of the campaign rarely hold on and prosper in the White House. The demands of winning an election and actually governing are just too different and require an entirely different set of skills. Axelrod survived two years as a senior adviser to Obama, but his role was mainly communicating the president’s agenda in coordination with the White House communications team and Obama himself. Karl Rove served as a senior adviser and deputy chief of staff to George W. Bush through 2007, but he never strayed into actual policy-making. Instead, he too adopted Caddell’s approach and remained in permanent campaign mode. As for Bannon, I think he touched on this obliquely in Charleston when he talked about winning the election with a coalition, but failing to hold the coalition together when it came to actually exercising power. There is no doubt that Trump’s surprise victory last November propelled Bannon to the upper echelons of political strategists. It happens every election cycle. Someone gets anointed the winning presidential campaign’s resident genius. Heading into the 2018 mid-terms, I think one story line to watch will be how the Bannon faction of the GOP tries to build a new coalition to back its preferred candidates, all with the idea of winning just enough to unseat McConnell. There are signs the coalition will look somewhat different from the 2016 model. Bannon clearly anticipates some defections — people on the fringes in 2016 who are now either not as enamored with Trump or of as firm a belief that he can get anything done — and that he’s looking for more diversity. A case in point: While in Charleston, Bannon met with black business leaders for a roundtable discussion on their interests and disappointments and how those jibe with his vision. And what is that vision a year on from Trump’s defeat of Hillary Clinton? In October, he told Fox News host Sean Hannity that he is “declaring war on the Republican establishment” in an effort to promote GOP leaders loyal to the populist, nationalist platform Trump campaigned on. To win his backing, potential challengers will have to vow ousting McConnell as Senate leader, and promise to end the Senate filibuster. “Nobody’s safe, we’re coming after all of them, and we’re going to win,” Bannon assured Hannity.